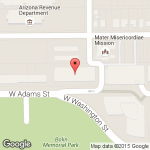 The Arizona State Cartographer's Office is dedicated to improving access to GIS information and geospatial data. Below are new geospatial web services that are available for your use. The AZGEO Clearinghouse is an initiative of the Arizona Geographic Information Council and is maintained and hosted by the Arizona State Cartographer’s Office. The clearinghouse is designed to provide GIS users with links to Internet GIS services, metadata, and geospatial data downloads. AZGEO was created to provide access to geospatial data resources for Arizona stakeholders. AZGEO also allows for group collaboration and tiered data distribution. The Arizona Imagery Server is an ArcGIS map service that allows the viewing of Arizona orthophotography. The service is intended to be used as an imagery service in desktop GIS applications for analysis or as a cached service in any application for higher performance basemaps. The online viewer in AZGEO may also be used to view the imagery by those without access to GIS software. The imagery is not available for download due to the large size of the data files. The State Cartographer's Office (SCO) was established in State statute in 1988 and was funded by the Arizona State Land Department in 1995. The SCO was created in large part due to the efforts of the Arizona Geographic Information Council (AGIC) in the belief that establishing funding for the SCO was a high priority in order to fulfill the objectives of the AGIC Strategic Plan. AGIC's Strategic Plan clarifies AGIC, as a policy board and the SCO as the as the state GIS data base developer and as the standards and data base coordinator. The State Cartographer is responsible for developing and managing a long term program for collecting, updating, and disseminating statewide information about GIS data resources in an Arizona GIS clearinghouse. This effort is ongoing. AGIC has identified as one of the main duties of SCO, the exploration of alternative funding sources for the development and maintenance of GIS data, which includes examining legal issues related to the access, cost recovery, and sharing of that data. We would like to work with as many of you as possible. Contact the State Cartographer's Office if you would like to arrange a visit. Efforts continue to ensure the most complete, timely, and authoritative geospatial information repository for the state of Arizona. Compressed and mosaicked DOOQ acquisition. Acquisition of USGS raster data in UTM NAD27 and NAD83.